Abstract : The area of surface reconstruction has seen substantial progress in the past two decades. The traditional problem addressed by surface reconstruction is to recover the digital representation of a physical shape that has been scanned, where the scanned data contains a wide variety of defects. While much of the earlier work has been focused on reconstructing a piece-wise smooth representation of the original shape, recent work has taken on more specialized priors to address significantly challenging data imperfections, where the reconstruction can take on different representations -- not necessarily the explicit geometry. 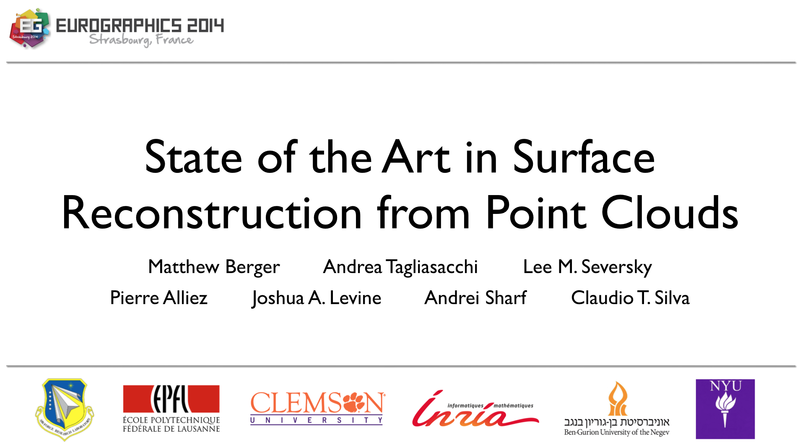 This state-of-the-art report surveys the field of surface reconstruction, providing a categorization with respect to priors, data imperfections, and reconstruction output. By considering a holistic view of surface reconstruction, this report provides a detailed characterization of the field, highlights similarities between diverse reconstruction techniques, and provides directions for future work in surface reconstruction.